The Cup: How the 2006 Ryder Cup was Won is the definitive account of Europe’s triumphant victory in the 2006 Ryder Cup from the pen of Ireland’s leading golf journalist. Irish Times Golf Correspondent, Philip Reid, has written the most incisive chronicle of the competition, drawing on his access to the European and American teams, their caddies, the officials, the fans and pundits from the world of professional golf. Reid goes behind the scenes to reveal the real story behind the 2006 Cup. He exposes the personal and political dramas that unfolded behind the scenes with as much tension and excitement as we witnessed on the greens of the K Club in Kildare. He takes us onto the fairways, exposing the teams’ tactics, and back into the clubhouse, where the players wrestled with personal conflicts and tragedies. The Cup is packed with fascinating anecdotes about the personal tragedies, those pictures, a shooting incident and Tommy the Barber’s brush with Boris Becker. 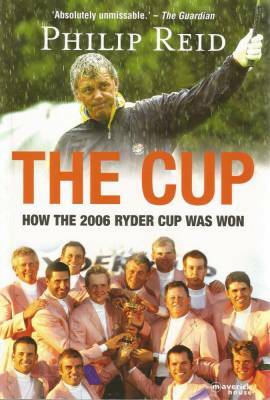 Unlike the plethora of similarly themed books published shortly before the competition, The Cup offers the serious golf enthusiast an authoritative and substantial analysis of the 2006 Ryder Cup.